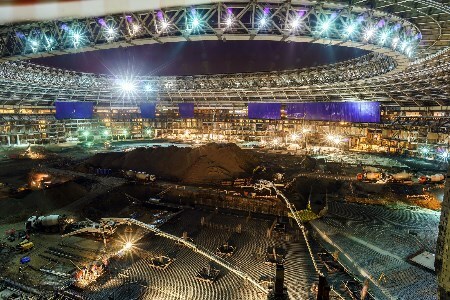 LafargeHolcim, a leading building materials company, has aided Russia's construction and reconstruction of key infrastructure projects, including eight of the twelve stadiums that will be used for the football tournament. The Group’s cement plants in Shurovo, Ferzikovo, and Volsk and aggregate quarries in Karelia Republic all played a vital role in providing construction materials for stadiums such as Moscow’s flagship Luzhniki Stadium, which will host seven matches including the opening game between Russia and Saudi Arabia, as well as the final. The project called for an uninterrupted supply of cement, additional quality control, and technical support in the composition of ready-mix concrete. The volume of cement supplied was more than 20 000 t for more than 60 000 m3 of concrete works. Most of construction elements were produced from this concrete: foundation elements, plates with a thickness of 600 mm, berms, stiffeners, columns, stands, and jet piles 20 mx 600 mm. In addition to the sporting venues, LafargeHolcim provided a wide range of construction materials for infrastructure projects, including airports, roads, tunnels and bridges, built to support the world’s most viewed sports event.